It should be clear by now that Jurassic Park is one of those films that will never be topped. Just as its sequel, The Lost World, was a disappointment following the success of the original, so too is Jurassic World: Fallen Kingdom a disappointment in the wake of 2015's Jurassic World. Jurassic World did a terrific job of repackaging the magic of the original Jurassic Park, reworking its predecessor's plot while updating the franchise for the 21st century. It was itself a meta-commentary on franchise filmmaking, and demands from both studios and audiences for bigger, louder, faster entertainment. Fallen Kingdom is all of those things, but without the nostalgic soul and reverence for its roots that made Jurassic World so special. Like The Lost World, Fallen Kingdom takes a darker turn, leaving the sense of wonder and awe behind in favor of something more akin to gothic horror. And like The Lost World, the characters of Fallen Kingdom return to the island on a rescue mission, this time in an attempt to save the dinosaurs from final extinction before an active volcano completely wipes out Isla Nublar. Claire Dearing (Bryce Dallas Howard), now leading an activist group to protect the dinosaurs, recruits Owen Grady (Chris Pratt) to return to the island in order to rescue his beloved velociraptor, Blue, so she can be relocated to another island that will act as a biological preserve where the animals can be isolated and protected. Her billionaire benefactor, on the other hand, has other plans - scheming to bring the dinosaurs back to the mainland in order to harvest their DNA and sell them to the highest bidder. It falls to Claire and Owen to stop these greedy mercenaries before they unleash a breed of dinosaur into the wild, weaponized for rogue governments and terrorist organizations. You have to give credit to director J.A. Bayona (The Orphanage) for trying something new here; the second half of Fallen Kingdom plays out like a classic Universal monster movie, spooky old mansion and all. The problem here is that the pacing is wildly uneven. Bayona runs the film full throttle from the very first scene and never lets up. As a result there is very little exposition or build-up of suspense. This not only creates fatigue in the audience, it opens up massive lapses in logic (the screenplay by Derek Connolly and Colin Trevorrow also does it no favors). For instance, the series has already established that there is a second island that has been set aside as a biological preserve for these animals - why spend so much time trying to extract them from an island that is about to explode when there is another perfectly good island with dinosaurs on it that they can use? It sets the entire film up on a flimsy premise to begin with that crumbles like a house of cards when put in context with the rest of the series. The film also weaponizes its nostalgia factor in ways that Jurassic World did not (or at least did more skillfully). How many times does the t-rex need to come to the rescue and strike its iconic pose? The t-rex no longer inspires any fear or awe, it's just a deus ex machina device for whenever the filmmakers paint themselves into a corner and feel like reminding us of better times and better films. That's not to say that Fallen Kingdom doesn't have its share of spectacular set-pieces. The destruction of Isla Nublar is appropriately harrowing (but feels like a climax in the middle of the film), and the film's second half is a beautifully shot homage to the classic Universal horror films of the 1930s and 40s. Michael Giacchino's thundering score also introduces a gothic choir into the proceedings to add to the horror elements. It is, however, more entertaining on a revisit than it is upon first watch. 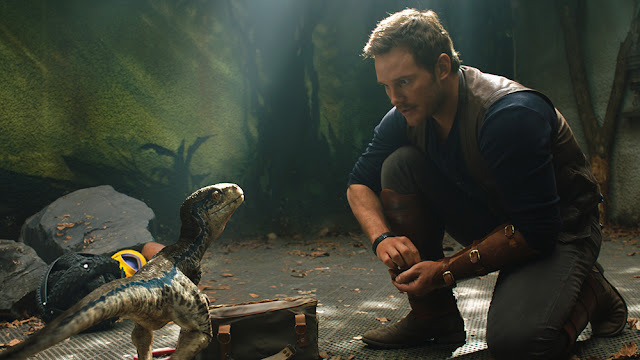 There are still elements that don't work - the cloned human child feels like an unnecessary contrivance, and attempts to connect to the original film feel more clunky and out of place here than they did in Jurassic World. Overall, Jurassic World is the stronger film - it's more tightly constructed and purposeful. But Fallen Kingdom is perhaps the better directed of the two. J.A. Bayona has a strong visual sense, and he crafts some spectacular images here - it's difficult not to feel a lump in your throat at the sight of the brachiosaurus on the dock as the island explodes behind it; the first dinosaur we saw on Isla Nublar in 1993 becoming the last as the island meets its fiery end. The entire haunted house thriller in the gothic mansion finale has a raw power to it, so much so one almost wishes that the filmmakers had gone all in on that angle rather than making the first half of the film a cursory (and all-too-rushed) visit to the island. Unfortunately, Bayona is saddled with a scattershot screenplay that he can only do so much with. The Malcom bookends feel more like lazy fan-service than solid plotting (but it's hard to say no to more Jeff Goldblum), and pretty much everything involving the villains feels oddly goofy. Come for the well-choreographed set-pieces, but don't expect them to be stitched together into a satisfying whole. And pick up the Blu-Ray for the nifty augmented reality Facebook Messenger feature that allows you to play with a digital Blue the baby raptor by bringing her to life from the comfort of your living room. It's one of the most creative and unique special features to come out of a home video release in quite some time, and is only available by purchasing the Blu-Ray. Jurassic Park fans won't want to miss a chance to share a picture of themselves playing with a baby raptor anywhere in the world. 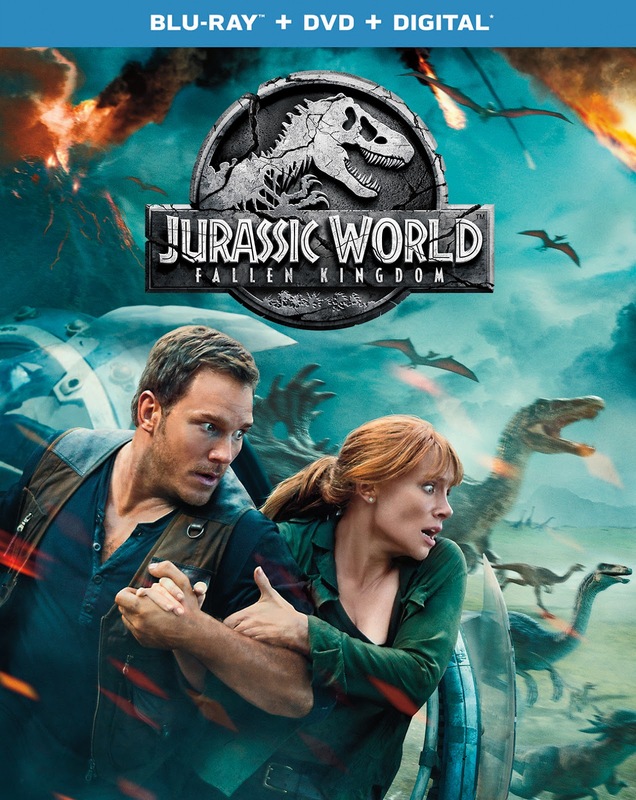 JURASSIC WORLD: FALLEN KINGDOM | Stars Chris Pratt, Bryce Dallas Howard, Rafe Spall, Justice Smith, Daniella Pineda, James Cromwell, Isabella Sermon, Toby Jones, Ted Levine, BD Wong, Geraldine Chaplin, Jeff Goldblum | Rated PG-13 for intense sequences of science-fiction violence and peril | Available today on Blu-Ray and DVD.